Habitat: Shallow, Rocky coastlines. They mainly swim in shallow water, but can be found in water as deep as 20 meters. 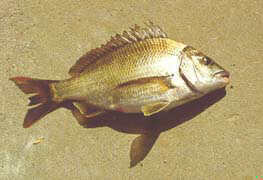 Bait: Bronze Bream have a natural vegetarian diet and so they will not take bait as readily as other species. They will take soft bait such as pink prawn, rock lobster or white mussel if it is well presented. Fishing Strategy: This fish often strips the bait off the hook before the angler has realised. The angler needs to try and set the hook when he feels tugging on the line. Eating Quality: Very white flesh, often fatty.